This black long jacket is 50% polyester and 50% rayon and is by Oleg Cassini. It has a nice full black 100% acetate lining. 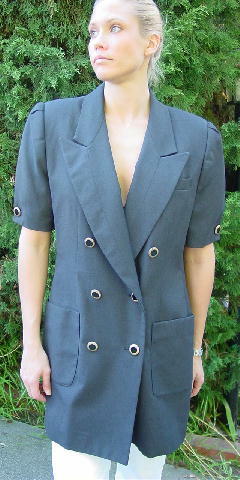 There are shoulder pads, short sleeves with one button on each, and long lapels. It has an open breast pocket and 2 lower front open pockets. There is a double-breasted styling with 6 gold-tone textured buttons with black inserts down the front and an interior clear button. The tag says size 14, but it fits like a size M/L. She wore it with pants and skirts. 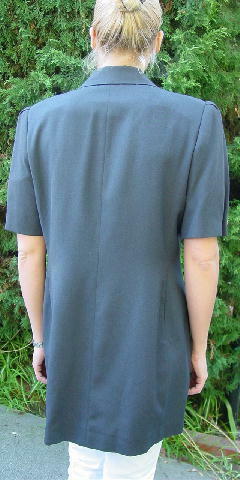 shoulder to end of sleeve 12 1/4"
shoulder to hem 33 1/2"
bottom hem side to side 24"